The traditional sofas have different classic style design and textures. The traditional furniture gives your room comforting and classic look. The versatile Richardson Full Convertible Sleeper Sofa will add elegance and style to your living room. This convertible sofa has a steel frame with metal to metal connections for long lasting strength and durability. 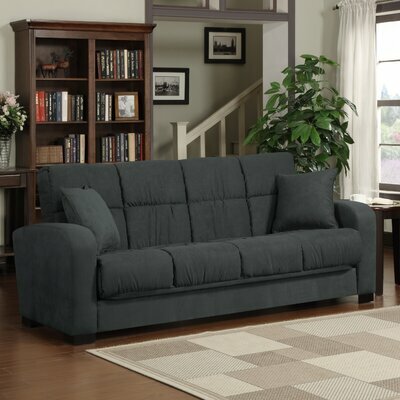 Microfiber upholstery in solid pattern and beautiful grey color further adds to its charm. This plush and comfortable convertible sofa easily reclines up to 180 degrees to transform in to a cozy bed. 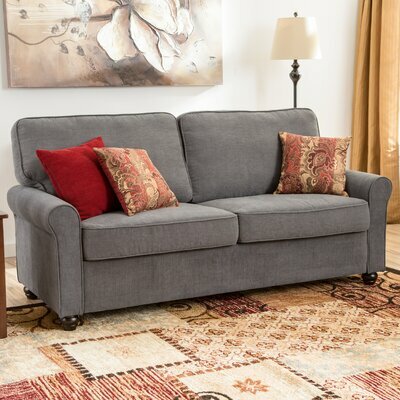 The graceful Richardson Full Convertible Sleeper Sofa is a smart choice for its versatility. Sofa frame is made from sturdy steel and metal-to-metal connections render additional strength to the frame. 576 independently wrapped pocket coil spring system with synthetic fiber and foam filling for a comfortable seating experience. Back cushion has no bar for a comfortable sleeping surface. Transforms in to a full size cozy bed within minutes. Reclines back fully to 180 degrees. The sofa allows you to comfortably sit, recline or sleep with its click style hinge for three different positions. Available in more fabric colors including Mocha and Sage Green. Upholstery fabric is 100% polyester microfabric. Sofa includes two throw pillows. Pillow top seat cushions offer additional coziness. Seat and back cushions are 10 inches thick. Back of the sofa is finished in the matching colored fabric. Maximum weight limit: 600 pounds. CARB compliant and maintains indoor air quality. The sofa requires assembly and it is easy to assemble. With its imperial look and intricate pattern, the Serta Upholstery Belmond Sofa will add elegance to your living room décor. Its classy traditional style is sure to adorn the look of your living room or guest room. The gorgeous sofa features clean lines and immaculate cuts that are further elevated by its fine finesse. 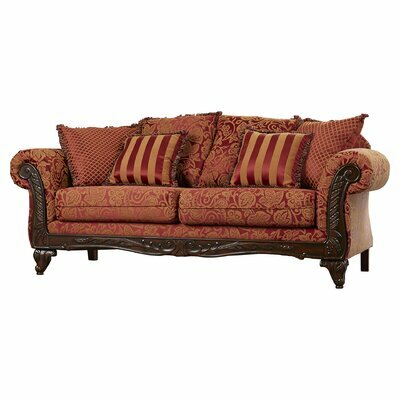 The ornate sculpted artwork at the front of the arms and bottom base of the sofa are eye-catching ad praise-worthy. Its sturdy and robust hardwood frame and easy-to-maintain polyester upholstery are durable to witness many years to come. This sophisticated sofa has flared arms and removable seat cushions. 12-coil gauge system renders optimum stability and comfort with maximum endurance. The sofa stands on beautifully sculpted legs that further add to its charming appeal. A quality product of USA built from various dark brown stained hardwoods. The corners and stress points of the individual frame pieces are reinforced by using blocks, glue and staples. Sturdy frame serves as an anchor for durable seating support. 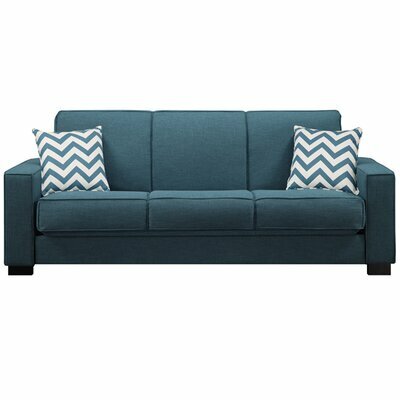 Sofa includes seat and back cushions, four large toss pillows and two small toss pillows. Checkered pattern on large toss pillows and stripes on small toss pillows. Back of the sofa is air-blown with polyurethane foam. Elegant flared arms are plush and comfortable. Tastefully designed legs feature ornate sculpted detailing. Finished back with red pattern fabric. Machine tested springs for lasting support and durability. Nylon bushings help in reducing noise. Maximum weight capacity of the sofa: 350 lbs. Product Care: Clean it with vacuum occasionally or wipe with a soft dry cloth to remove dust and soot. Bedeck your living room with the elegant and refined look of Axelle Sofa. Crafted from sturdy wood and premium materials, this sofa is durable and long lasting to endure the wear and tear of time. With its linen blend upholstery and thick cushioning, this sofa is very plush and relaxing. The decorative nail head trim detailing at the front panel of the arms accentuate its overall look. The off-white color exudes an air of refreshing charm and makes this sofa beautiful. The stunningly elegant sofa is paired with four fluffy pillows that have urban script print on them for a classy look. Crafted out of sturdy wood. Beautifully upholstered in neatly tailored linen fabric. Covers of cushions have zipper. Includes four fluffy accent pillows. Pillows have eye-catching urban script on them. Scrolled arms with decorative nail head trim detailing. Stylish feet in dark brown color. Product Care: spot clean the sofa with a linen-safe cleaner. Built to last, the aesthetically appealing Sadbury Upholstered Sofa is luxuriously comfortable to sit on. 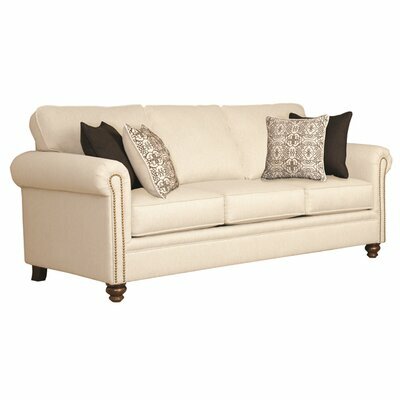 Upholstered in oatmeal colored linen blend, this sofa sports a simple yet elegant look. Accentuated with button tufts, the rolled arms and back of the sofa provide you with relaxing and cozy space to lean on. The fluffy seat cushions feature feather down topped pocket coil system for a comfortable seating space. Upholstery fabric is 50% cotton and 50% linen. Backrest and arm panels are artistically tufted. Seat cushions are reversible and removable. Rolled arms with silver nail head trim details on the panel. Sturdy solid wood legs support and balance the sofa. Sofa requires assembly and is quite easy to put together. 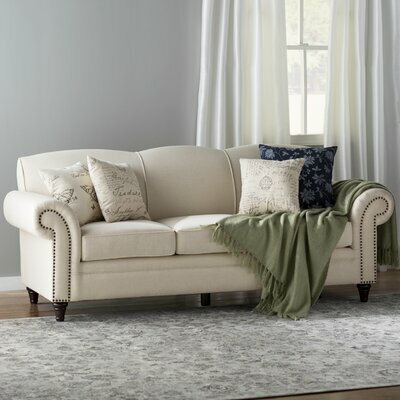 With its timeless look, this elegant and stylish Caroll Sofa by Serta Upholstery by Three Posts will adorn your living room space.This sofa features a reinforced hardwood frame which is robust, durable and long lasting. The plush cushions are filled with high-density foam that are immensely comfortable when you rest on them. Rolled arms with nail head trim detailing and brown bun feet create a refined and classy look that is hard to ignore. Built out of sturdy wood and reinforced hardwood. This sofa is also available in Bamboo (light green) color. Upholstery fabric is 68% polypropylene and 32% polyester. Cushions are reversible and removable with zippered covers so they can be easily removed for washing purpose. 2 chocolate colored toss pillows and two pillows with intricate print on them. Round arms accented with nail head trims. Sofa rests on gorgeous brown colored bun feet. You are tired and want to watch your favorite movie while lying on your sofa? Bring home this versatile Convertible Sleeper Sofa by Mercury Row and enjoy your quality time with comfort. The back of this stylish and chic sofa easily folds down to convert its seat into a full size bed. The core of the sofa has a sturdy steel frame for superior stability. The seat and back of the sofa is generously cushioned with foam for a relaxing good night’s sleep. Featuring track arms and dark brown block feet, this gorgeous sofa boasts an on-trend modern upgrade coupled with stylish toss pillows with Greek Key print. This sofa has seating capacity for 3. Reclines fully to convert into a full size, 51 inches wide bed. Upholstered in 100% polyester linen. Back of the sofa is also upholstered for a refined and finished look. Available in more fabric colors including Blue Linen, Green Linen, Purple Linen, Smokey Charcoal Grey Linen, Green and Blue. Includes couch, two toss pillows, legs and arms. Seat and back cushions are thickly padded with foam and synthetic fiber. Toss pillows feature stylish Greek Key print. Sturdy dark brown block feet support the sofa. This sofa comes with one year limited manufacturer’s warranty. Product care: vacuum when needed and spot clean only with cold water and a mild detergent. The elegant and comfy Warren Sofa by Andover Mills will upgrade the style of your living room décor. The traditionally fashioned rolled arms, bun feet and crisp welt tailoring together create a timeless look that is hard to miss. The super-soft gray-blue or chocolate upholstery enhances its appeal and fits seamlessly with a wide array of room decors. Kiln-dried construction for extra sturdiness. Fabric color: Gray-blue or chocolate. Upholstered in easy-to-maintain upholstery-grade woven fabric. Cushions are filled with high-density foam. Back and seat cushions are loose. Both back and seat cushions are reversible and can be flipped. Stylish and sturdy bun feet. With its timeless classy look, the Pirton Sofa will create a stunning focal point in your living room. The best feature of this traditionally styled sofa is its ornate almond toned sculpted showood base, front of the arms and round legs. Impress your guests and family members with the imperial look of the Pirton Sofa. The exceptional design of its upholstery and immensely comfortable seats and back will win the hearts and praise of your guests. Assembled in United States of America with global components. Upholstered in woven textured fabric. 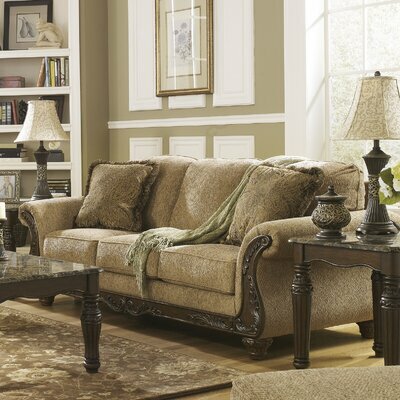 Decorative and intricate sculpted work on the almond toned wood at the bottom of the sofa and front of the arms. Fixed back cushion with stress welting for a crisp shape and durability. Boxed edge seat cushions with welt tailoring detail for a crisp and classy look. Stylish and chic look of the Clickett Bonded Leather Sofa is sure to glamorize your living room space. 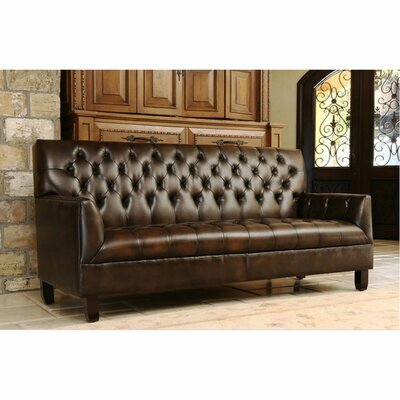 The sofa provides both comfort and class with its durable two-toned brown colored leather upholstery. The tuxedo arms, seat and back of the sofa is accentuated with tufts for an elegant and classy look. Very spacious sofa with seating capacity for four. Frame of the sofa is made out of kiln dried hardwood. Upholstered in hand rubbed bonded leather. Upholstery features beautiful two-tone brown color. Arm panels and both seat and back cushions are tufted. Hand stitched detailing for a classy and traditional look. Cushioned with high resiliency 2.0 density foam for additional comfort. Stylish legs in warm brown finish. The praise-worthy look of Verwood Premium Sofa is sure to grab the attention of your guests. 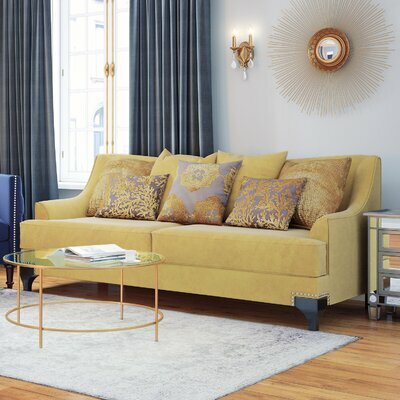 It features low sweeping arms and elegant gold colored ultra-soft upholstery made from polyester suede fabric. The fashionable T-cushion seats with no-sag springs allow you to sit comfortably and enjoy a relaxing evening with your family. Gorgeous toss pillows in beautiful colors and intricate floral prints give you additional comfort. Crafted in USA from hardwood for long lasting sturdiness and durability. Corner blocking and guard for structural integrity. Silver nail head trim just above the frontal legs. Upholstered in ultra-soft polyester suede fabric. Also available in Light Grey colored fabric. Stylish T-cushions give modern touch. Springs are coated with polytetrafluoroethylene so they don’t squeak. Cushions are filled with Dacron wrapped foam. Matching pillows with intricate floral print. Upholstery and foam comply with California flammability standards. This gorgeous sofa is best for residential use.